There’s been a lot of talk lately in the Manchester area, and one place that keeps getting a mention is a bar that ‘is proud to stay true to the principles of bartending’. 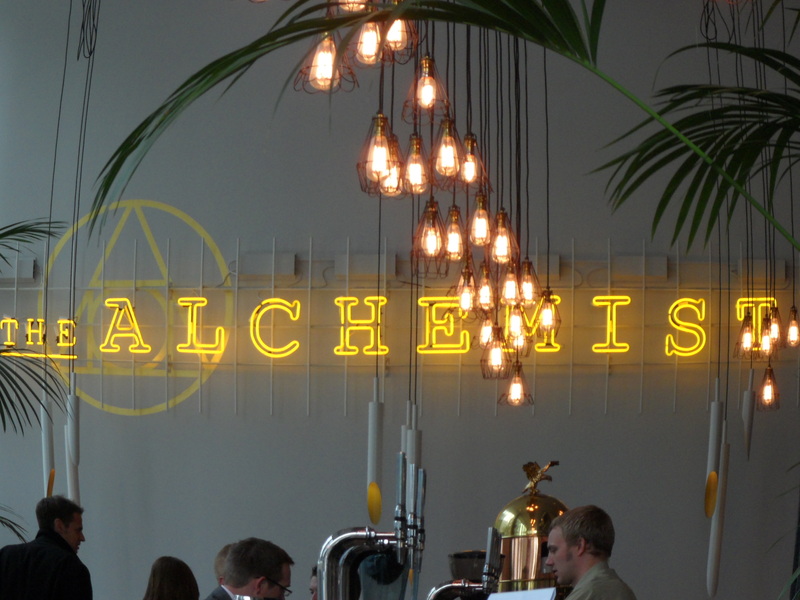 They name themselves The Alchemist, and their situated in the busy Spinningfields area of Manchester. They were in the running for the title of ‘Best Bar’ in last month’s Manchester Food & Drink Festival awards, it utilises a corner section of one of the buildings, where you enter to be greeted by a range of friendly staff (a touch which I feel needs to be standard in all restaurants and bars). I made my way to the bar and was handed both a food and drinks menu to scour through, although my attention was diverted to their rather impressive back-bar of spirits and wines! 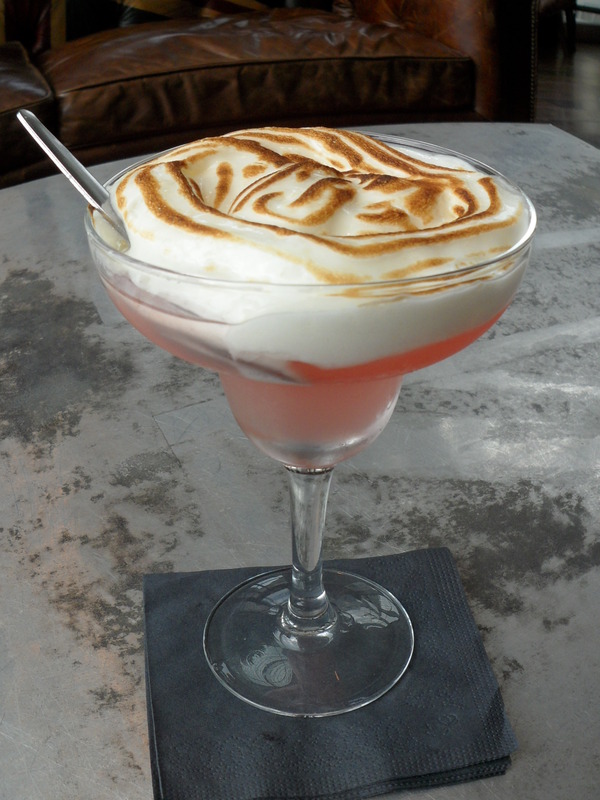 I like my passion fruit in drinks so I plumped for a Passion Fruit Meringue Martini (£5.95), which boasted a mix of Russian Standard vodka, passion fruit liqueur, passion fruit syrup, lemon mix and culminating in flambéed meringue foam. The finish product looked very impressive, with their policy of ‘staying true to the principles of professional bartending’ shining through in their creating of the meringue. The drink itself was rather light and well balanced, with a hint of sweetness on the palate lingering on the after-taste (great for my sweet-tooth!). 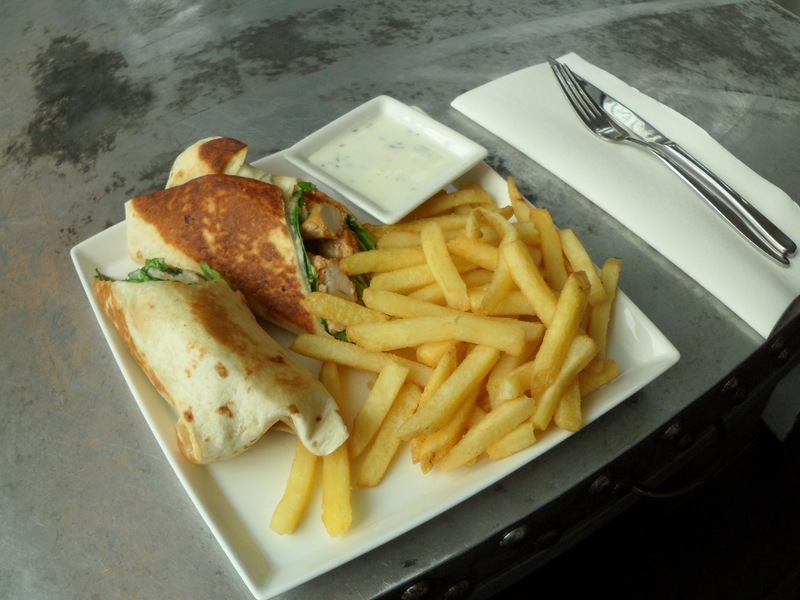 While I was enjoying the Martini in the comfort of their old fashioned Union Jack leather sofas, my Chicken Tandoori Wrap (£6.75) arrived with a good portion of crispy fries to go with. The dish looked ample to someone who was after a bite to eat instead of a full lunch, and with a pot of sour cream sauce to compliment, I can safely say it went down a storm! The chicken wasn’t too overpowering in its flavour, and there was a good wrapping of salad to boost your 5-a-day. Too often I’ve eaten wraps where the chicken has cooked the salad that comes with it, but this seemed to be spot on. It’s as if the chefs have the same policy as the bartenders – attention to detail. Whilst enjoying a Diplomatico Rum Reserva Exclusiva over ice, I took in the surroundings that The Alchemist has to offer. There’s no shortage of places to sit, with a long perch table along the window as well as comfy leather bar stools and scattered tall tables close by. The restaurant itself is situated at the end of the bar (although you are more than welcome to eat at any of the bar tables) with simple traditional dark wooden square tables leading around the side. Their use of lighting is a noticeable feature too, with snow lights falling from each large windowpane, which at night must look the part from both inside and out. The bar has small lanterns hanging from the ceiling in a range of different lengths and theirs a sign of The Alchemist on the wall that surprisingly doesn’t look out of place. The bar itself is also a sight for any professional bartender to get a little bit giddy over! A spirit collection that includes Chase vodka, Elements 8 rum, Martin Millers gin, a range of Patron tequila and my personal favourite of Diplomatico Rum Reserva Exclusiva are all below small alcoves of the wine selection that stretches the length of the bar. Highlights of the list include Johnson Estate Marlborough Sauvignon Blanc (£25.95 or £6.20 / £8.85 for a 175ml / 250ml) for the whites, a Castillo de Clavijo Rioja Reserva (£21.95 or £7.35 / £5.25 for a 175ml / 250ml) in the red section and for the rosé drinkers a ‘classy and seductive’ Dinastia Vivanco Rioja Rosardo (£23.95 or £8.15 / £5.70 for a 175ml / 250ml). Their range of wines start at the £13 bracket and rising to £42 for those special night outs. Champagne and Prosecco are also available with brands such as Veuve Cliquot Yellow Label (£65), Prosecco Doc Bel Star (£23.95) and Dom Perignon 2002 (£135) chilled for you to enjoy. Cocktails are also a main attraction here, with the menu divided into 6 main categories. Depending on the style of drink your after, there’s no shortage of options and ideas. The list includes ‘Artisan’ (hand-crafted) cocktails from The Alchemist’s very own bartenders, molecular techniques involving smoke, foam and fruit dust and a rather interesting concept that includes the use of flavoured caviar. One that caught my eye was the Maple Manhattan. Woodford Reserve is stirred into Antica Formula (red vermouth), aromatic bitters and grapefruit zest. It’s then topped with lemon and maple syrup foam! Non-alcoholic cocktails are also available with a good selection of teas and coffees to finish your visit off. © David Marsland and Drinks Enthusiast 2011. Unauthorized use and/or duplication of this material without express and written permission from this blog/sites author and owner is strictly prohibited. Excerpts and links may be used, provided that full and clear credit is given to David Marsland and Drinks Enthusiast with appropriate and specific direction to the original content. have beautiful skin, erase wrinkles, get a lot more youthful appearance click here -. Start now to make a conscious choice to do at least one thing that you can do in an outstanding way. you’ve always wanted to be. so small, the incisions made in the skin when performing chin lipo are very tiny. chin. The first four months are said to be fine for Pole Dancing. adopt a healthy lifestyle and to start burning more calories than you eat. Occasionally there is a problem with the biological machinery. the person you’ve always wanted to be. Previous PostPrevious What to look forward too . . . . . .